This bar is probably mostly 700 years old. If you approach it from the trail or the front notice the height of the bar and its arrow slits as you approach, these [rather than the stone men hurling rocks from the top!] help make it the strongest bar. 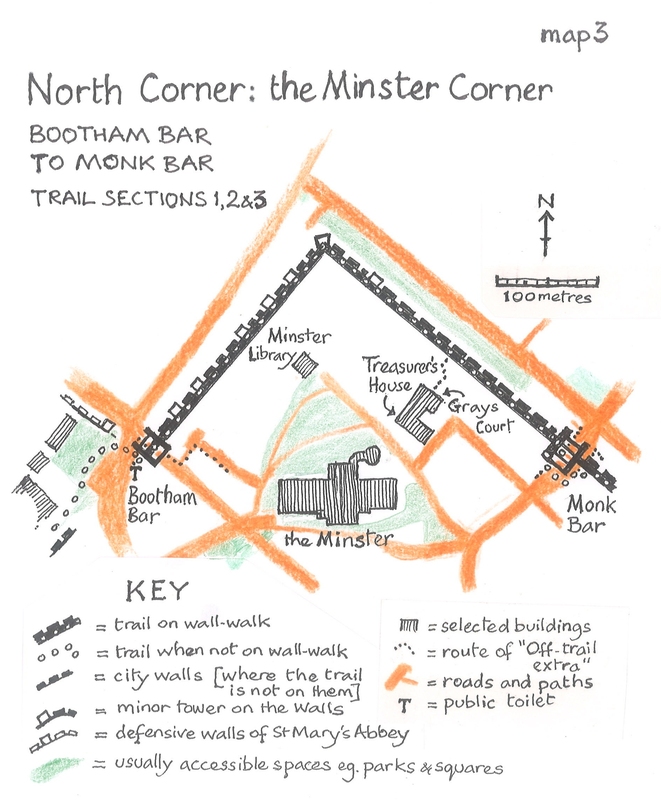 The trail enters Monk Bar and turns right immediately to avoid a little museum with the bar’s medieval toilet and a portcullis complete with the machinery for winding it up and down. 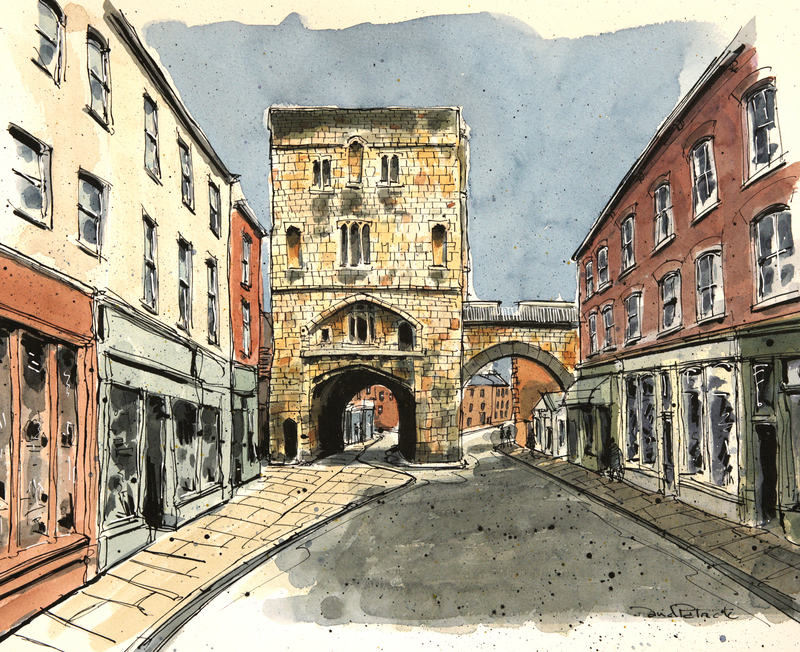 The trail goes down narrow, low-roofed, steep steps which contrast well with the Victorian steps to the pavement at Bootham Bar. The steps you go down seem designed for defence –and you’d have to cross to the other side of the bar, through a guarded room, to get to the steps that go higher in the bar. Turn left at the pavement and a brass trail stud in the pavement on your left suggests you should enter the bar’s arch. Do this [watch out for bikes from behind you] and, on your right, a blocked doorway in the wall is left from the times when traders would be stopped as they went through these bars and made to pay “murage”. Murage was a tax on goods being brought into York for sale, a tax which went to pay for the Walls -and for the murage-collector who came through this door. Go to the exit from the arch, look up to see the spikes of the portcullis, waiting to slide down between its grooves and seal off this arch. Go a metre further and you can see above you the dark “murder holes” through which things could be dropped on anyone attacking the portcullis. If you are in a hurry its best now to retrace your steps to the city side of the arch and then to cross [be careful: traffic may come from left or right] the road at the traffic lights. The trail continues up the steps in front of you. The top storey of this tall bar was probably added at the time of King Richard III during what are now called the Wars of the Roses. He was probably York’s favourite [and Shakespeare’s least favourite] king and much of the museum in this bar is about him [for more about the museum, see the off-trail extra:1]. 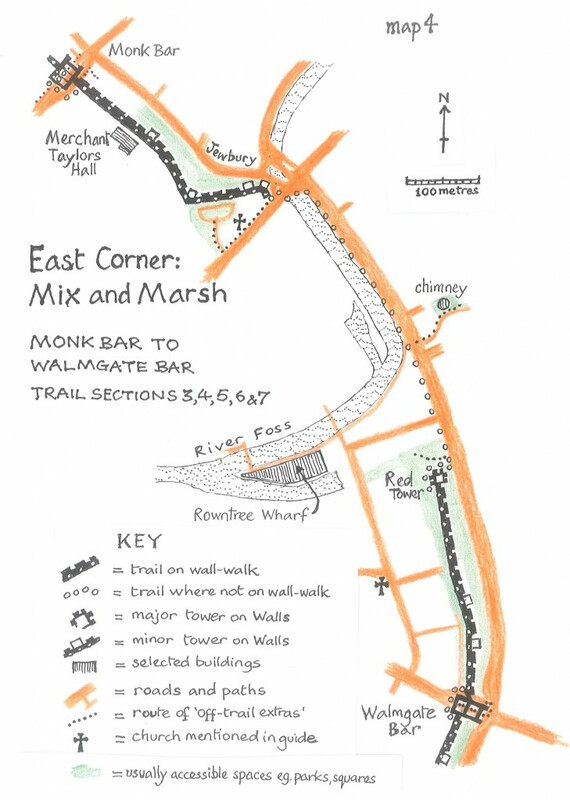 There are 2 information boards about the bar for reading from the pavement -and one of the metal maps for rubbing [see the “Information Boards” section in the Appendix]. The “basics” section mentions the space under the bar’s main arch [the arches through the wall on either side of this are 19th century] this medieval space is stone vaulted so it could resist attacks by fire. 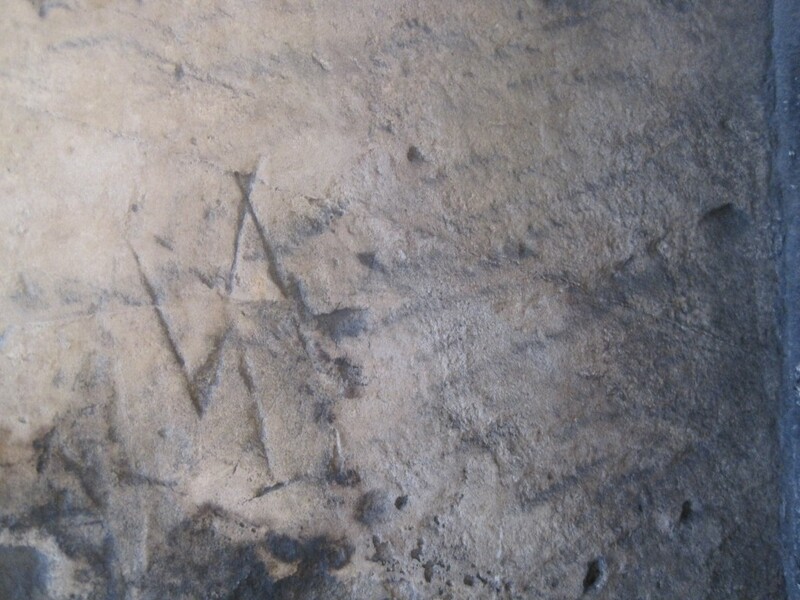 Several masons’ marks have been recorded here, the easiest to find is at eye-level, on the second stone to the right of the blocked up doorway, it’s a bit like a modern wind turbine but with just two broad blades [more about such marks is at the end of the “Stone and Stonework” section in the Appendix]. In medieval times the ground under the portcullis would not have been paved as the points on the portcullis were to fix it firmly in the earth [not to pierce attackers caught underneath as it came down!]. A portcullis fixed in this way has none of the weak points of an ordinary door [no hinges or lock to give way]. 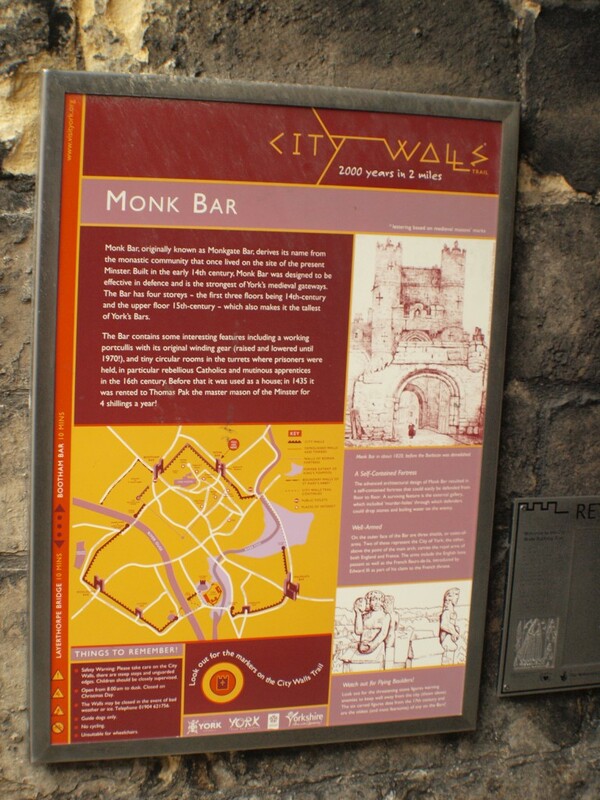 It is thought that every gate through the Walls once had a portcullis, but now Monk Bar’s is the most complete. 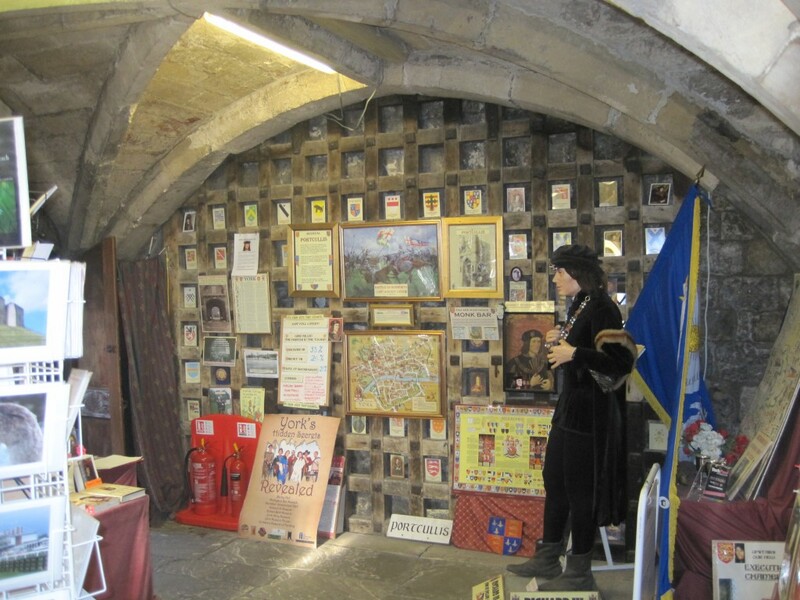 The small museum inside the bar is newly run by the York Archaeological Trust and is newly branded “the Richard III experience”; the trust is a charity that charges for entry to its museums so it is only free to visit the entry floor with its shop [and most of the portcullis]. Visiting the whole museum can tell you a lot about one of England’s most controversial kings and it also lets you explore some of the inside of the bar. As well as the “garde-robe” [medieval toilet], the portcullis and its raising machinery, you can see how the bar was designed to resist attack with narrow stairs on alternate sides of the bar and stone ceilings. You can also see the little turret room that was probably used as a prison called “Little Ease” [as even lying down would be difficult there]. Walk about 15 metres past the portcullis and look back at the front of the bar [if the pavement is busy there’s a small alleyway]. High above the archway you can see the balcony for the defence of the portcullis below it. 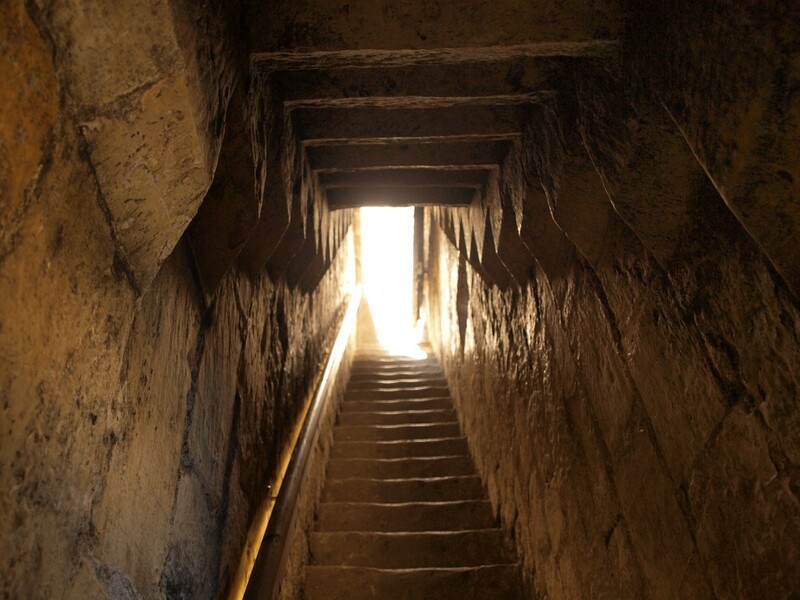 There are arrow slits but in the centre towards the top you can see 2 small square holes with a small cross-shaped slit above each one, these are for cannon, the slits were used to aim the cannon. Near the corners, at the level of the lowest arrow slits, are what look like small, metal studded, wood doors –one at each side of the bar. They really are doors and only make sense when you realise that the bar had a barbican stretching out from it. These doors allowed the wall-walks of the barbican to be manned by defenders coming from the bar. The barbican reached roughly to where you are standing. It had a gate that attackers would have to get through before finding themselves in what was called “the killing ground” –they would be faced by a portcullis and surrounded by walls manned by defenders looking down on them. 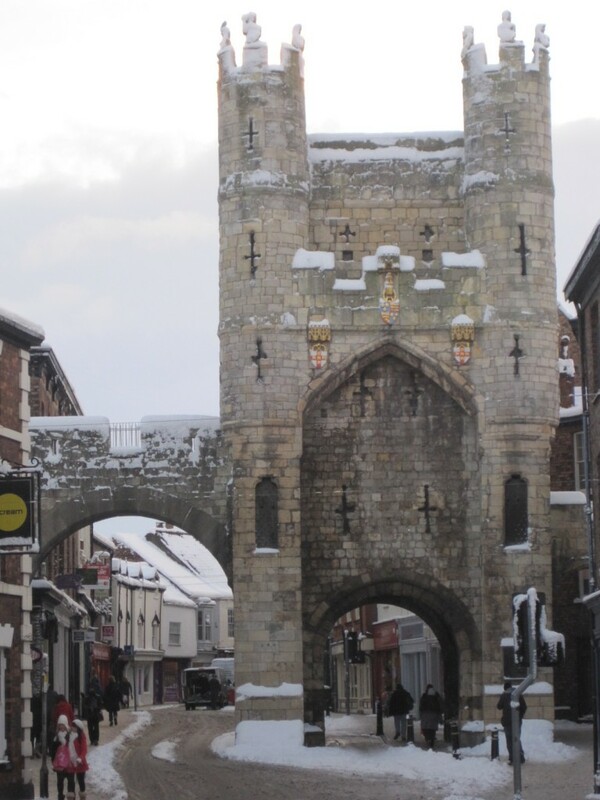 In the early 19th century all the bars except Walmgate had their barbicans demolished –mainly because they got in the way of traffic. The painted stone shields on the front of the bar are a royal coat of arms from the Middle Ages and York’s coat of arms [gold lions on a red cross of St George]. If you go 10 or so metres into York from the bar the street is often busy but you can look up at the only medieval back wall to a bar that York still has. 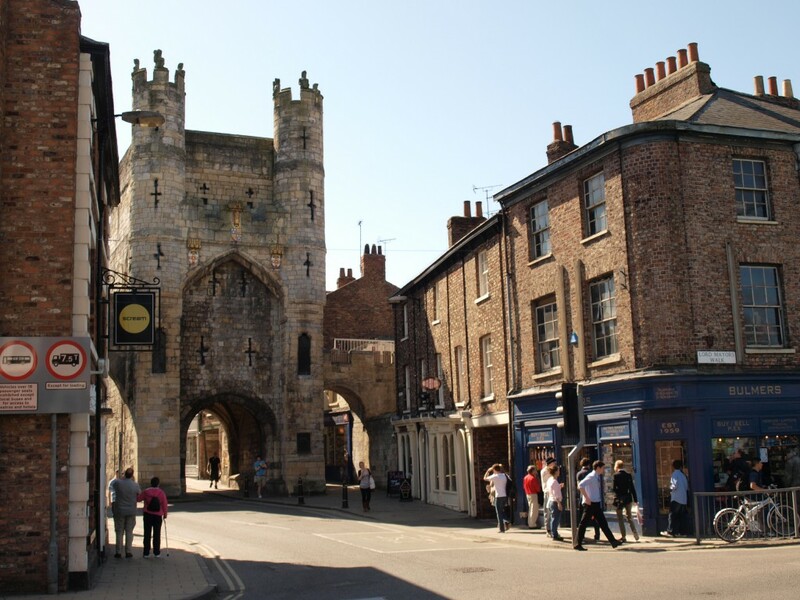 You can see that it has proper windows rather than arrow slits as the bar was designed to be defended against attacks from outside York and it doubled as a home in the Middle Ages. Rents from the use of the bars as homes were one way money was raised to pay for the repair of the Walls. The balcony just above the arch is thought to have been one of the places used for public proclamations. As you look at the bar from outside the walled city, the Keystones is on the corner on your left. This is an ordinary pub in the Scream chain but its open air seating is extraordinarily well situated. To the right of the pub there is level access from the pavement to this eating and drinking area. 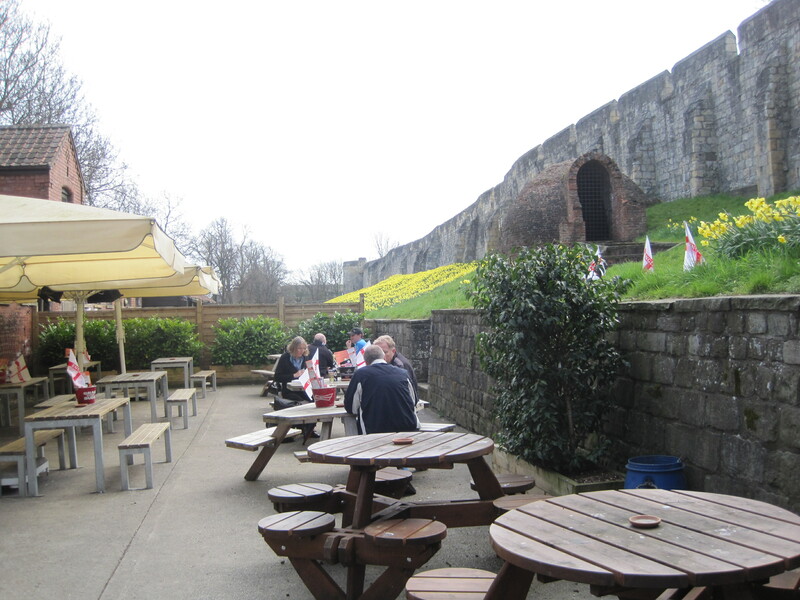 From this area there is fairly level access to the pub’s bar and its toilets [including one for the disabled]. The area is well sheltered from the road and the weather; it is beside the outer ramparts, with excellent views of the Walls. An added interest here is a Georgian ice house built into the ramparts [for more details see East corner: part1: details]. 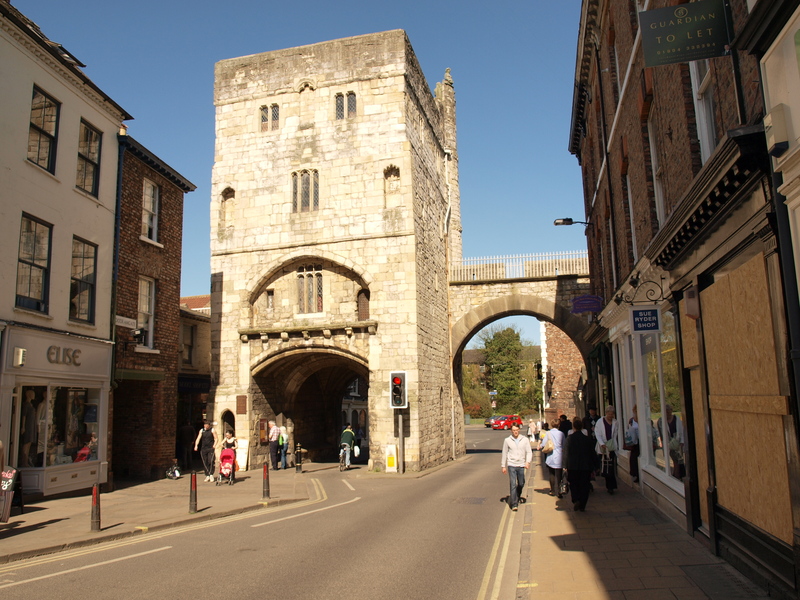 Monk Bar is often described as having a “working portcullis” –the English often like to be thought of as modest, masters of understatement, but this claim about the portcullis seems a gross exaggeration. Firstly, as the work of a portcullis is to seal off a gateway against attack, to say we have a working portcullis seems a worrying reflection on law and order in modern Britain. To be fair, most people probably take the claim just to mean that the portcullis goes up and down. However the portcullis certainly doesn’t go up and down often at the moment. One information board at Monk Bar says that it went up and down weekly till 1970 but this seems a mistake, most people say that regular lowering stopped before the Second World War. It is true that the portcullis seems to have much of the equipment that was once used to raise and lower it –in particular it has a long windlass or winch that can be turned by stakes being put into it –but it is usually said that the last time anyone actually tried to use this equipment to lower the portcullis was in 1953, to celebrate the crowning of the Queen. Closing a medieval gate might be thought a slightly odd form of celebration but in any case it was not crowned with much success. It is said that a few weeks after the coronation local papers noted that it took 10 minutes to get it down but 2 weeks to get it up again. The story is that while the gate was being raised a chain pulling it up broke, some say that the side pulled by that chain fell which jammed the whole heavy gate firmly into its stone slots –others say the whole portcullis fell and buried its spikes deep into the tarmac of the road. It is agreed that simply getting and fitting a new chain and pulling on it was not enough to release the jammed gate. Until very recently the problems encountered seem to have deterred people from suggesting that this portcullis should be “worked” again, but in the spring of 2013 it was suggested –to mark the 60 years passed since the coronation. The then owner of the museum was not keen to try it again –but perhaps now the York Archaeological Trust is in charge of the museum we can look forward to archaeological experiments with the portcullis!